(Nanowerk News) In adopting the Austrian Nanotechnology Action Plan on 2 March 2010, the Federal Government provided a clear mandate for its implementation and required the presentation of a progress report on the Plan's implementation by the end of 2012. This requirement has been met by way of the Implementation Report now available. Nanotechnology is a dynamic sector of growing importance to society, research and business. In the Strategy for Research, Technology and Innovation (FTI Strategy) Austria adopted on 8 March 2011, the country professes its commitment to nanotechnology. The Austrian Nanotechnology Action Plan with its different fields of action has turned out to be an appropriate tool for the use of this technology in Austria. 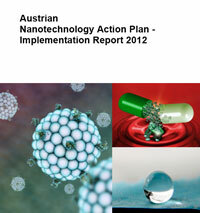 A raft of measures put forward by the Austrian Nanotechnology Action Plan were implemented between 2010 and 2012. In the process, interdisciplinary cooperation across organisational and departmental boundaries was the key to success. More than 20 different organisations participated in implementing the Action Plan. The extensive cooperative efforts contributed significantly to ensuring a targeted implementation and optimising the use of resources. A key aspect of the Nanotechnology Action Plan is to strengthen communication and the dissemination of information to specific target groups, particularly the interested public. By developing an information portal for nanotechnology, the public's desire for impartial and understandable information on the fundamentals, opportunities and risks of nanotechnology has been addressed. A prime objectives was to engage the public in the process of drawing up and implementinga Nanotechnology Action Plan. To this end, the draft Action Plan underwent public consultation in the Internet in autumn 2009 and the Implementation Report in November 2012. The feedback received was published online and taken into account in the Action Plan and Implementation Plan respectively. It has become clear that nanotechnology offers Austria, as a high-tech hub, great opportunities, for example in environmental and energy technology, in the development of new materials and surface coatings, with products such as cosmetics, and in medicine. Owing to the lack of data, however, it has been impossible to quantify the opportunities to date, particularly in the environmental sector or for small- and medium-sized enterprises. In many companies, nanotechnology appears to have become an integral component of product and process development. Studies have shown that the utility factor plays a crucial role in the public acceptance of nanotechnology. The utility criterion also plays a crucial role with such market-based instruments as sustainable public procurement and the eco-label. Consequently, any benefit resulting from nanotechnology applications should be communicated in a transparent manner and demonstrated accordingly. With a view to making best possible use of nanotechnology's potential, measures in the field of research policy and internationalisation have been drawn up at European and global level on the basis of the government's FTI strategy and now these measures need to be implemented. Having a sufficient number of skilled professionals is of particular importance for Austria in its role as a centre of innovation. The country is well on track to ensuring just this, also owing to the organisation of training courses. It is essential that the safety of nanotechnology applications be ensured in order to take sustainable advantage of the opportunities this technology affords. A major part of the Action Plan is dedicated to making headway in safety research and regulatory issues. Between 2010 and 2012, a series of measures were implemented to help close gaps in the risk assessment of nanomaterials. The implementation of the Austrian nano-EHS Programme for research on the health and environmental risks of nanomaterials contributed significantly to these objectives. It is important to strengthen Austria's research capacities (basic and applied research) and heighten its profile in the European Union and worldwide at the same time. A host of activities have been undertaken in the field of occupational health and safety. The first priority was to intensify cooperation and provide information with a view to warranting safe nanowork. A guide for the risk assessment of nanomaterial use at work and information has been made available. In future, the challenge will be to keep this information up to date and to supplement it where necessary. It is clear that many different European regulatory arrangements have a bearing on nanomaterials. These regulatory arrangements and test methods are currently being adapted to accommodate the specifics of nanomaterials, with some of the adjustments already in place. Austria is actively contributing to these processes. Regulatory adjustments and clarifications will raise the standard of health, environmental and consumer protection while increasing the level of legal certainty for companies. The publication of a framework definition for nanomaterials by the European Commission in October 2011, in particular, helped to improve consistency in legislation on nanomaterials and thus to strengthen legal certainty. Consistency in the implementation of regulatory instruments, particularly through the executive efforts of the Member States, and a more intensive exchange of information between legal areas are important future fields of action. Such efforts will further enhance synergies and promote a more efficient use of resources. The present Implementation Report puts forward a number of forward-looking recommendations. On the strength of these recommendations and on account of the dynamics inherent in nanotechnology, the Federal Government is slated to consider a reassessment of the subject matter in 2015.